Cookies are America’s most popular dessert, and for all those late night, emergency cookie baking sessions, or any cookie event, about half the cookies baked are chocolate chip. There are an estimated 2,000 varieties of the popular cookie, from chocolate chip banana to white chocolate chip raspberry, but the most popular is the Toll House cookie recipe found on the back of each Nestlé chocolate chip package. Their tourist lodge was housed in a building (circa 1709) where, at once, travelers paid their tolls, changed horses and enjoyed home-cooked meals. The Toll House Inn was well known for Ruth’s cooking, especially her desserts. She regularly sent travelers on their way with a plate of her delicious cookies. One otherwise uneventful day in 1937, Ruth added little chunks of a Nestlé’s Semisweet Yellow Label Chocolate bar to her butter cookie dough. The story goes that Ruth received a lifetime supply of chocolate in exchange for her recipe, which Nestle’ printed on the back of their semisweet chocolate bar packages. The cookie recipe has been so popular that Nestlé started marketing chocolate chips for use especially for cookies. Over time, the popular Toll House Inn included many well-known guests, for example – guess who? – President John F. Kennedy. Almost a century after Ruth dropped that first piece of chocolate into her biscuits, every bag of Nestle chocolate chips in North America has been Wakefield’s first, Toll House recipe printed on the back. Just like Ruth’s recipe, all simple chocolate chip recipes call for flour, sugar, butter or margarine, baking powder and/or baking soda, eggs, vanilla, and chocolate chips. The flavor and texture varies with recipe. 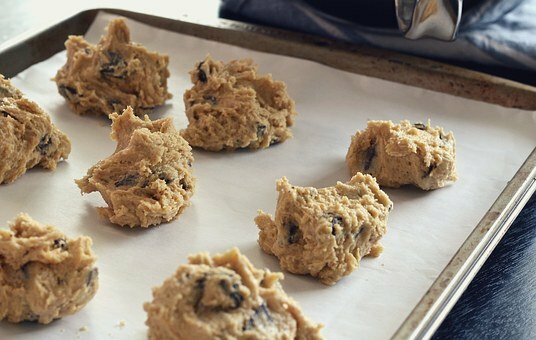 Some chocolate chip cookies bake puffy and others flat. The easiest to decorate are flat. Decorate chocolate chip cookies? Yes, these are especially unique for Jenny and Jeff’s school parties – that is, if you aren’t too tired after your all night baking session! Chocolate chip cookies are tasty enough without icing, but a small decoration will make one of the most popular mom in the class! While chocolate chip cookies don’t lend themselves to the fancier, polished cookie bouquets, they can be quite cute and cheerful – precisely the thing for 85-year-old Aunt Myrna, who wed her yoga teacher, or Cousin Jim who just graduated from bungee-jumping course – with flying colors! Preheat oven to 375° F. Roll cookie dough into 2-inch balls. Arrange four balls on an ungreased cookie sheet. Add a lollipop stick into each ball. Press dough down slightly. Once cooled (about 20 minutes), decorate your cookies with a decorating bag and royal icing. Use icing sparingly so as not to detract from the wholesome cookie taste. For the”cookies and milk” theme, you might want to add white icing milk moustaches. Following the icing hardens, wrap each cookie in cellophane and tie with a ribbon. Arrange in a mug (for the milk!) that matches your theme.